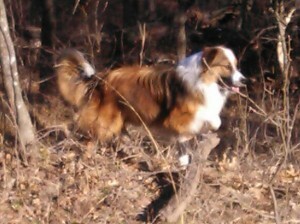 Sam is a moderate-to-high energy dog who has worked cattle and goats. He varies his intensity to suit the stock he’s working with – he can gently move a goat kid, yet is also effective with stubborn cattle. He works only when needed, is moderately biddable and learns quickly. Sam loves enforcing the rules and is diligent about patrolling his property and stock, becoming restless if the daily routine is upset. He’s gently protective of livestock babies and children. He doesn’t tolerate strange dogs on his territory unless introduced by his owner, but loves all human visitors whether he knows them or not. Sam’s excellent at detecting and eliminating vermin by scent and sight. He will tree, hold and bark for extended periods of time.